Riot police clashed with demonstrators and foreign exchange dealers in Tehran on Wednesday over the collapse of the Iranian currency, which has lost 40 percent of its value against the dollar in a week, witnesses said. 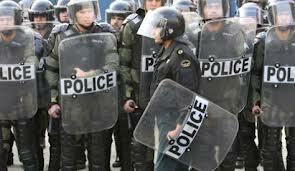 Police fired tear gas to disperse the demonstrators, angered by the plunge in the value of the rial. Protesters shouted slogans against President Mahmoud Ahmadinejad, saying his economic policies had fueled the economic crisis. The rial has hit record lows against the U.S. dollar almost daily as Western economic sanctions imposed over Iran’s disputed nuclear programme have slashed Iran’s export earnings from oil, undermining the central bank’s ability to support the currency. Panicking Iranians have scrambled to buy hard currencies, pushing down the rial. With Iran’s official inflation rate at around 25 percent, the currency’s weakness is hurting living standards and threatening jobs. “Everyone wants to buy dollars and it’s clear there’s a bit of a bank run,” said a Western diplomat based in Tehran. Tehran’s main bazaar, whose merchants played a major role in Iran’s revolution in 1979, was closed on Wednesday, witnesses said. A shopkeeper who sells household goods there told Reuters that the instability of the rial was preventing merchants from quoting accurate prices. The protests centred around the bazaar and spread, according to the opposition website Kaleme, to Imam Khomeini Square and Ferdowsi Avenue — scene of bloody protests against Ahmadinejad’s re-election in 2009. Protesters shouted slogans like “Mahmoud the traitor – you’ve ruined the country” and “Don’t fear, don’t fear – we are all together,” the website said. Iranian authorities currently do not allow Reuters to report from inside the country.  The national currency dived to a record low on Tuesday to 37,500 to the U.S. dollar in the free market, from about 34,200 at the close of business on Monday, foreign exchange traders in Tehran said. On Monday last week, it traded at around 24,600. Ahmadinejad on Tuesday blamed the crisis on the U.S.-led economic sanctions on Iran and insisted the country could ride out the crisis. He urged Iranians not to change their money for dollars and said security forces should act against 22 “ringleaders” in the currency market. The rial’s slide suggested the Western sanctions were having a serious impact. On Sunday, Israeli Finance Minister Yuval Steinitz said Iran’s economy was “on the verge of collapse”. Many businessmen and ordinary citizens say the government is at least partly to blame for the currency crisis, and Ahmadinejad has been criticised by enemies in parliament. The rial has lost about two-thirds of its value since June 2011. Its losses accelerated in the past week after the government launched an “exchange centre” to supply dollars to importers of basic goods; businessmen say the centre failed to meet demand for dollars. Parliamentary news agency ICANA quoted Mohammad Bayatian, a member of parliament’s industry and mines committee, as saying enough signatures had been collected to call Ahmadinejad to parliament for questioning over the rial’s fall. University students protested in front of parliament on Monday over a lack of government-subsidised dollars for their studies abroad, the Iranian Labour News Agency reported. The impact of sanctions on Iran can be seen across the Gulf in Dubai, a major centre of trade with Iran. At the Dubai Creek, a crowded waterway from which motorised dhows ship goods to Iran, merchants said Iranian business had fallen off dramatically in the last two weeks. “Everyone is losing; traders from Iran are losing because of the depreciating rial, and we’re losing here because Iranians can’t afford to buy our products any more,” said Ahmed Mohammed Amin, 53, an Iranian trader who has lived in Dubai for 40 years. Websites providing rates for the rial stopped updating on Tuesday, and Dubai money changers said they were not selling the rial because they had lost contact with their Tehran counterparts. Odd, wouldn’t you think that the police’s wallets were ALSO starting to get empty? Or, maybe it’s ’cause they work for Bashar! You know, jim … O.K., they DID get rid of the Shah … but is their life REALLY an improvement?? Maybe they could’ve just forced the Shah into liberalizing?? It appears your “god” is a very vengeful “god”. Btw your comments are nearly as disgusting as the shiite commentators comments. Enough of your preaching, it does nothing but annoy the living crap out of people! If that is your aim, then you are succeeding. Plumbline, Although I believe that this site is not the place to be preaching, Knowing that this David Foltman is getting pissed off with it kind of makes me extremely happy. So please keep it coming Nothing like seeing a Zionist pig in pain. Plumbline, Although I believe that this site is not the place to be preaching, Know that this David Foltman is getting pissed of with it kind of makes me extremely happy. So please keep it coming Nothing like seeing a Zionist pig in pain. Instead of sending money to Hezbollah and Syria, use the money for the Iranians.